We start off by slicing our zucchini up nice and thin and grilling them just enough to soften up to a nice 'noodle' consistency. Our lasagna meat 'sauce' is made from 99% lean ground turkey, black beans, fresh corn, cumin, chili powder, garlic, lime juice, jalapeno, diced tomatoes and freshly chopped cilantro. We used a can of diced tomatoes to speed things up! 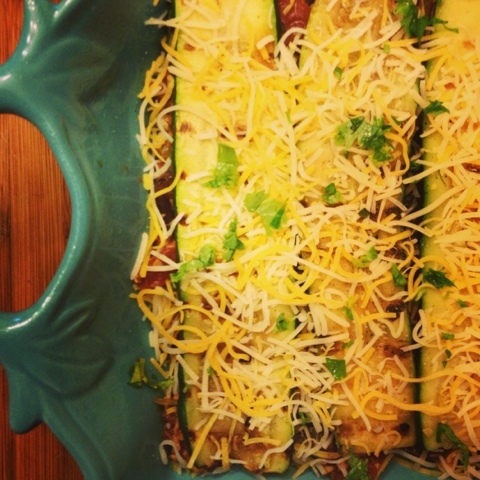 We made this Fajita style by sauteing up poblano peppers and red onions and stuffed them inside each and every layer! 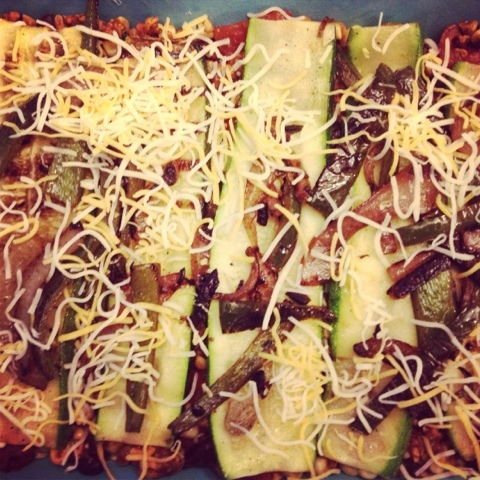 We layered this lasagna style and had ourselves a VEGGIE PACKED Mexican lasagna at only 269 calories per serving! Does it get any better than that?? 1. Slice all zucchini up as thinly as possible (we just used a knife, but a mandolin slicer will make it easier). You will need 24 slices. Spray grill or saute pan with non-stick spray. 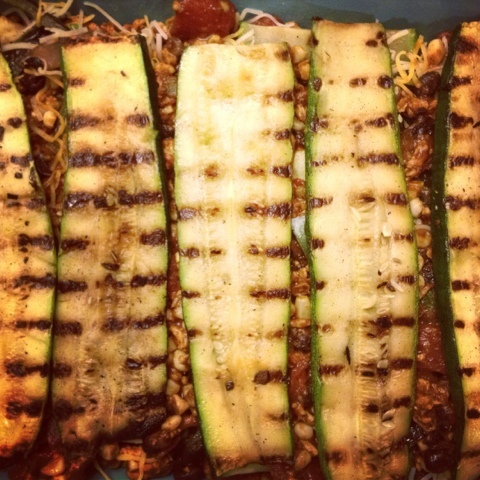 Grill zucchini slices approx 2 minutes per side or until soft. Set slices aside onto paper towels to allow excess moisture to drain out. 2. In saute pan add half of garlic and ground turkey with cumin and chili powder. Cook for approx 5-7 minutes or until meat is no longer pink. Add beans and corn and stir to combine flavors. Add juice from both limes and half of cilantro. Add can of diced tomatoes and salsa of your choice. Stir to combine flavors and set aside. 3. In same saute pan add one tbsp olive oil with remaining garlic and poblano peppers and red onion slices. Saute for approx 10 minues or until soft and caramelized. 5. Begin to assemble lasagna. Spray baking dish with non-stick spray. Line pan with meat sauce. 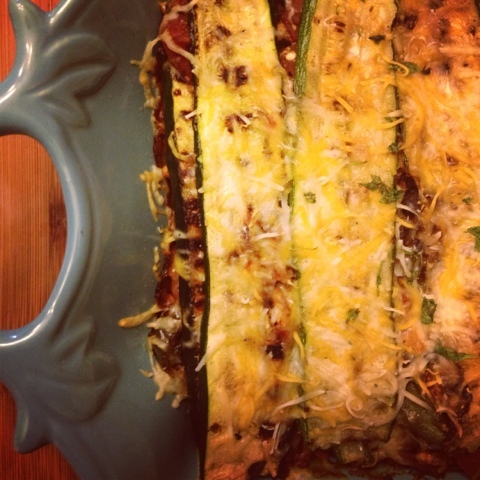 Then add zucchini slices. We laid 6 noodles down. Top with peppers and onions, cheese then meat sauce. Repeat noodles, peppers & onions, cheese, meat sauce. Repeat. The final layer add 'noodles' then cheese and the remaining cilantro. Bake at 400 for 20 minutes or until cheese is bubbly and brown. Oh, awesome! I will definitely be trying this! 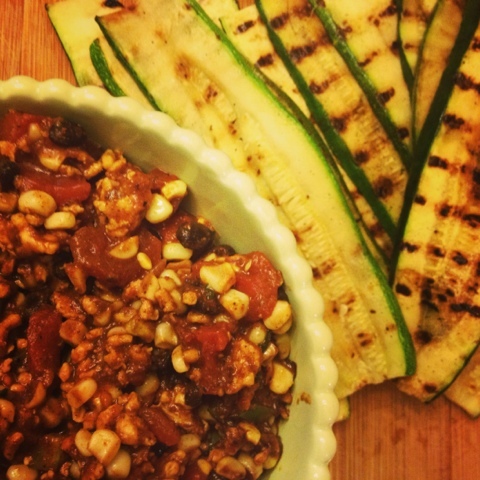 Stopping in by way of Thursday's link up and all of these dishes are delightful! I will totally use your page as a reference.. especially since I cook a lot and lost over 230lbs! Holy cow, this looks so delicious! Had to stop by and pin while I was here! So glad you all enjoyed! !